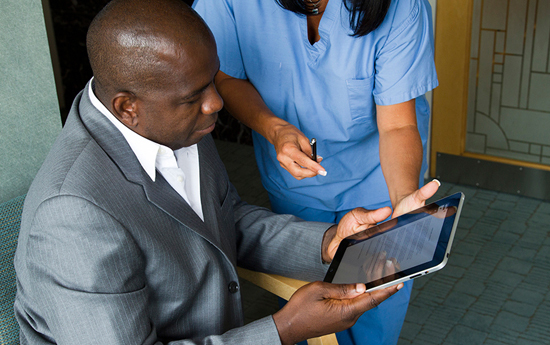 Connected Health » Features, iPad/tablet PC apps » Will the iPad become your doctor’s favourite gadget? Will the iPad become your doctor’s favourite gadget? Gone are the days of the iPad being solely reserved for business meetings and pretentious guys in the corners of our coffee shops. Recently they’ve started to pop up in more and more unusual places, they’re in our schools, our supermarkets and our aeroplanes, which is actually no surprise given how compact, slick and intuitive they are. But increasingly they’re also being used in our hospitals, GP surgeries and dental surgeries, and over the past few years have proved to be valuable assistants to doctors all over the world. They’re being used to replace paperwork, study scans, check up on patients and even read about symptoms and take a 3D tour of a body. However, we think it’s the fact the devices are so portable that makes them really appealing to anyone in the medical field. After all, most hospitals have plenty of computers nowadays, but none that work quite so quickly and allow you to sit right next to a patient as you use them. Recently, Apple’s interest in the medical uses of the iPad have been brought into question. According to this video from Mashable, Apple needs to be careful about how it markets the tablet, although there are apps specially designed for businesses and medical professionals, the FDA would have to step in and approve it if the brand started calling it a doctor’s best friend. However, if Apple is aware that it needs to steer clear of marketing the tablet as a medical product, then why does a man called Afshad Mistri have the title of Apple’s medical market manager? A recent article in Wired highlighted Mistri’s role and questioned whether Apple had any interest in moving further into the medical arena and marketing or even adapting the device to be used solely in hospitals. Many have suggested that rather than leaping into the medical field, the preoccupation with the iPad’s role in hospitals and reason for Mistri’s position actually stems from Steve Jobs’ personal interest in pioneering new technologies that could improve healthcare (whether they’re marketed that way or not). Regardless of Apple’s plans for the future, it’s interesting to see so many doctors using the iPad on a daily basis. It’s also particularly fascinating that a device children use to play Angry Birds could so successfully help doctors diagnose serious illnesses at the same time. Well done iPad, you’re probably the most useful and multi-functional gadget the world has ever seen!